Oh, do I have a favorite holiday sweet potato dish for you! Dessert or side, you decide. It's an old one but a great one! Cook as many sweet potatoes as you wish. Sweeten to your taste with either brown or regular sugar. Add vanilla, cinnamon, nutmeg, ginger, nuts....whatever you want to make it your own. There really isn't a set amount of anything. 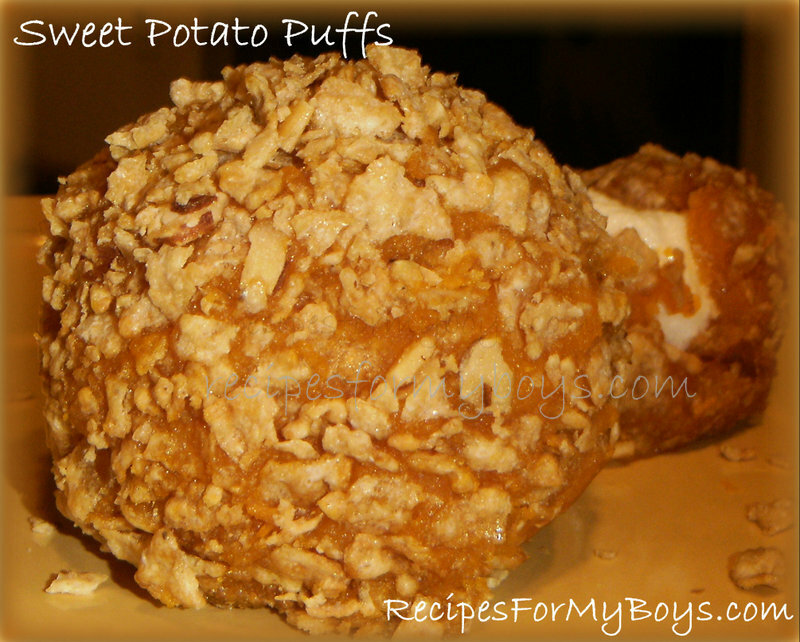 It's your old sweet potato casserole rolled up in a ball with the marshmallows hiding inside!!! Boil sweet potatoes, peeled and cut in chunks, in salted water until fork tender. Grease muffin tins, cookie sheet or casserole dish or pan. Mash potatoes with margarine while hot. Add spices and flavorings if using. When sweet potatoes are cool enough to handle, form a ball around one marshmallow. Roll ball in crushed cereal, nuts or coconut. Put in greased muffin tin, casserole dish or pan. Bake for 4 minutes, check. Keep a close on on them as they will go from round to busted in a matter of seconds. or when coating is starting to brown, whichever is first. If in muffin tin, run a spoon around and gently lift up and out of pan onto a platter. Enjoy the look on your family and friends faces when they see what is inside.